The entire purpose of this zodiac travel compatibility test is to determine how well you can travel with another individual based on your star signs. We’ll tell you how well you and your companion will do as traveling partners. This travel horoscope calculator will also let you see the type of trip that each of you will enjoy. Sometimes this will cause you to choose a slightly different trip from the one you had planned or perhaps a day trip to a location of your partner’s choice. Use the Travel Compatibility Reading to find the best vacation destination for you. Travel astrology is based on the date of birth and is designed to help you learn your travel preferences. Every one of us has things that we particularly enjoyed when we travel and things that we deeply dislike. Some may like to take a trip that is full of adventure, while others would choose an elegant and luxurious time on a cruise ship. Most of us choose to travel with at least someone. So we need to know how we will react to traveling with that individual. Will the trip be perfect? Or will we end up arguing back and forth throughout the trip? The travel astrology compatibility report can provide answers to these questions. How we react to different types of trips, adventurers, trekking, and lazy sun filled holidays is affected by the zodiac sign are born under. The sun signs or star signs are a major factor in determining personalities and so affect our choice of holiday. If you are an individual who is super active, an adventure trip will be THE TRIP for you. But if you are extremely laid-back, love luxury this will not be the correct vacation for you. If you want to know how to plan the ideal holiday for a Leo, or determine which locales would be enjoyed by and Aries, this zodiac travel compatibility test can assist you. If you are planning vacations and holidays, trips are going to be extremely expensive. It would seem to be a shame to have your trip spoilt by arguments amongst your fellow travelers. 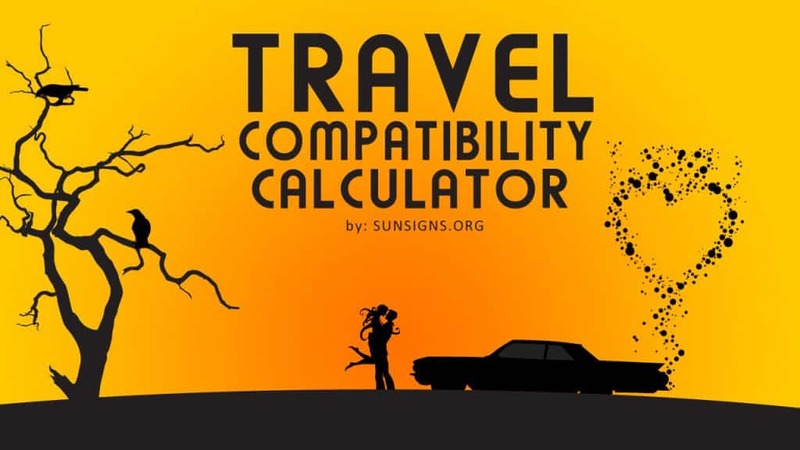 The use of the astrology travel compatibility calculator will allow you to get a good idea of what each of the members of the party may enjoy. Maybe, you can then find some side trips designed for each of the party members. If for example you were going to resort, there could be a chance to para-sail which would suit the adventurous in your group but the luxury-loving one might enjoy rejuvenating spa treatments. In this way you can provide an activity for each member of the party that they will all enjoy and each of you will enjoy seeing the other having fun. What Is Astral Plane & Travel? Previous Palmistry Compatibility – Test Your Love By Reading Palms!